This pattern was submitted by Arie Originz. 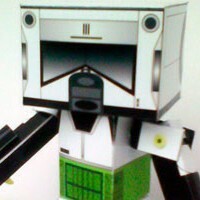 He made his own creation of Star Wars scout trooper style Danboard / Danbo. He numbered this template, 13. It kooks like he already made a bunch of paper crafts using this "danboard" like figure. Danboard or Danbo is a very popular character among anime and manga enthusiasts. Although the figure shape only boxes with minimalistic face, it like it contains a live in it. Arie also made this paper craft articulated. The pattern is in JPG in RAR file. I was a bit boring with paper model so I decided to refresh my mood for a while. I decided to make a full armor costume of Sandtrooper, I think this imperial unit is really cool, with all the stuff in his backpack and a big gun. I started with the most difficult part, the helmet. So I began searching for the existing pepakura template on RPF.com and found one that in my opinion is quite detail and accurate. 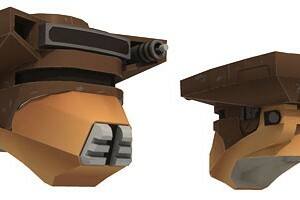 It is ANH Hero TK helmet pepakura file unfolded by Fierfek. The original pep was unfolded solely for making resin helmet master purpose, so the segments are too many to be made by using foam. I want to use EVA foam for the helmet and rest of the armor material because it's cheap, very easy to cut and bend and also very lightweight. Then I edit the file by reducing 3d segments, replace some parts with new parts, and edit the 3d a bit to be use as a template that specially setup for foam material. I even create a photo album for this project in my Facebook as you can see the photos below. This pep file scale is set to 1 (1:1 scale), the complete helmet is 27 cm / 10.6 inches in height (my size), if you want make it bigger change the scale with 1.1 if you want to have 110% size or 1.05 for 105%. For those who don't know yet, this helmet was used by Princess Leia in disguise as Boushh the bounty hunter in Star Wars - Return of The Jedi. She was on a rescue mission to freed Han Solo at Jabba's palace in Planet Tatooine. I made this helmet specially for my daughter. 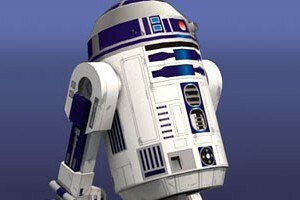 She always had fun around me when I am trooping in Star Wars costume, as biker scout, and she wants her own costume. 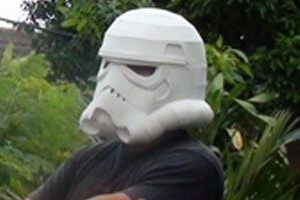 This helmet also specifically designed to utilized paper or card as the final material, not like many pepakura helmet files around that intended to be processed further with resin. I have enlarge 154% from the kids size so it will fit an adult head. The templates are in A3 so I recommend to use 300 gram card, and print them at print shop with docu printing or laser print. Next Sunday my local Star Wars fans community will be performing 3 minutes of galactic saga on stage at Hellofest 8 - cosplay and animation expo. 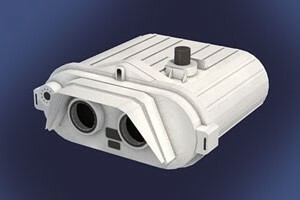 I got a role as a sniper scout trooper, I need a binocular that imperial trooper usually used so I made this binocular in 1:1 scale or life-size. I made a quick modeling and the templates are almost entirely white, I didn't have the time to weather the surface.